The Judgment of Paris Forum - Prosit Neujahr! The Judgment of Paris would like to wish all of our readers, and indeed every aficionado of timeless beauty, a very Happy New Year. May 2013 see even further advances in the aesthetic restoration, whereby full-figured goddesses recapture their traditional and natural role as the feminine ideal. Indescribably gorgeous Katherine Roll (MSA Models, size 18), 45-38-49, the most perfectly proportioned of all plus-size models, from FFFWeek 2012. Click to view larger. The beginning of a New Year is always exciting, but unfortunately for the timeless beauty aesthetic, it brings more attacks against it. The New Year was barely rung in, and the onslaught of diet ads proliferated the media. I hope that this lovely site remains active and vibrant for this New Year and the coming years ahead. There are so many of us, beautiful, full figured and sensual women who desperately need an outlet where we can feel accepted. 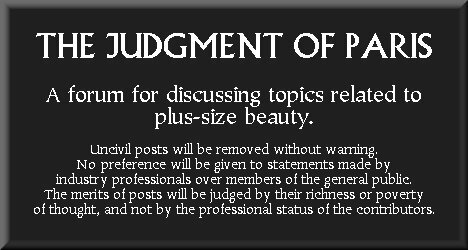 I hope The Judgment of Paris continues to flourish, and provide the much needed haven for plus-size women of all walks of life to come and feast on the true beauty ideal.